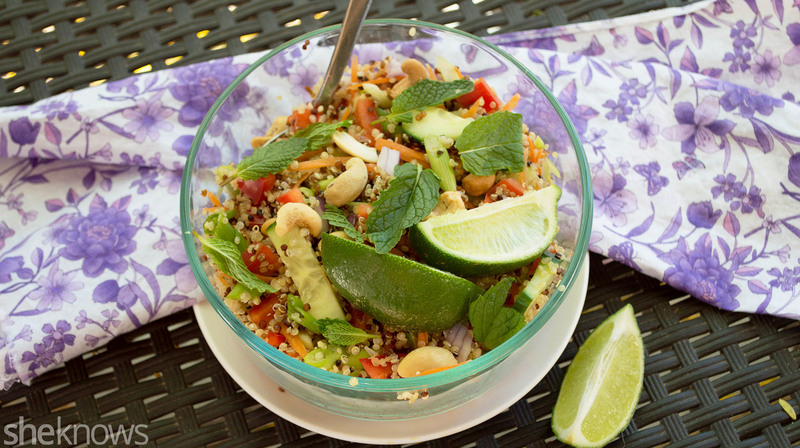 Making delicious gluten-free and vegan food isn’t as stressful as you think, and this recipe for Thai quinoa salad takes the guesswork out of what to make. Served chilled or at room temperature, this easy salad uses cooked quinoa simmered in vegetable broth to give it a ton of flavor. Once cooked, I added lots of diced veggies and tossed it all in a creamy homemade dressing. For the dressing, I wanted both sweet and spicy flavors, but if you don’t want your dish as spicy as mine, then just omit the Thai pepper and the Sriracha sauce, or add smaller amounts. This salad also packs well, making it great for picnics or a day at the beach. 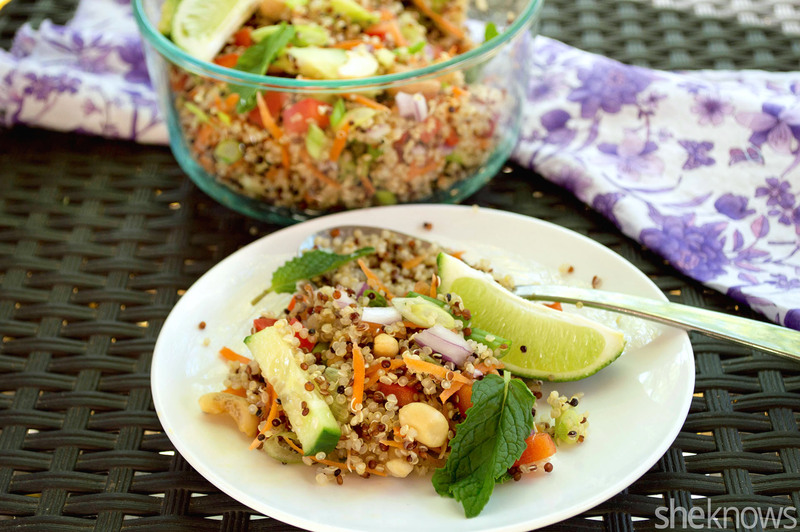 Slightly sweet and spicy, this vegan, gluten-free quinoa salad is full of fresh veggies that are tossed in a creamy coconut-Sriracha sauce with a hint of sweetness from agave and freshness from mint. Blend on high until the mixture is very smooth. Transfer to a jar with a lid, and store in the refrigerator until ready to use. To a large pot, add the vegetable broth and quinoa, and bring to a boil over high heat. Once boiling, stir well, and reduce the heat to medium-low. Cook the quinoa until all the liquid has been absorbed, about 10 minutes. Remove from the heat, transfer to a mixing bowl, and allow the quinoa to cool for about 10 minutes. Once the quinoa has cooled, add all the vegetables, and drizzle with the chilled dressing. Toss the salad well, and divide among serving bowls or plates. Garnish with extra mint and roasted cashews, and serve.